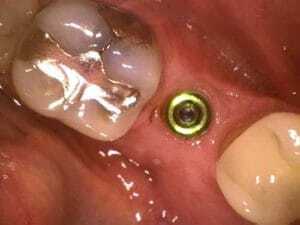 Dental implants are the new standard of care in the replacement of single and multiple teeth. This routine procedure is performed under local anaesthetic and at your desired level of sedation. A dental implant is a titanium root that is surgically placed in the bone to replace missing roots. 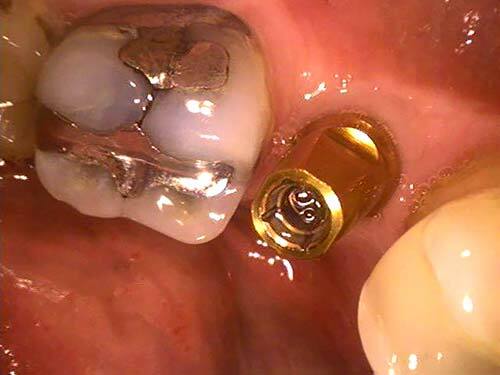 A crown is then placed on top of the implant. Dental implant treatment is now considered one of the leading ways to correct missing or damaged teeth. 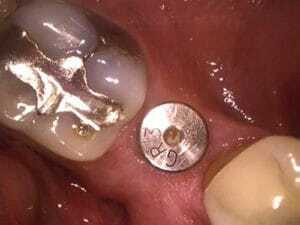 The latest implants are designed to replicate the look and feel of natural teeth within the mouth. This means patients achieve normal use of their teeth after the treatment, and can ensure that patients look and feel their best for many years to come. Dental implants are comprised of two specific parts: the implant, which replaces the root of the tooth and the restoration, which is custom-fitted to match the natural shape of the tooth crown. Dental implants are surgically placed within the patient’s mouth to mitigate the need to place dentures, bridges or other restoration products for the patient. They are a great option for a complete range of restoration processes and can be integrated in a short treatment time by the team of dentists and dental hygienists here at Guelph Village Dental. 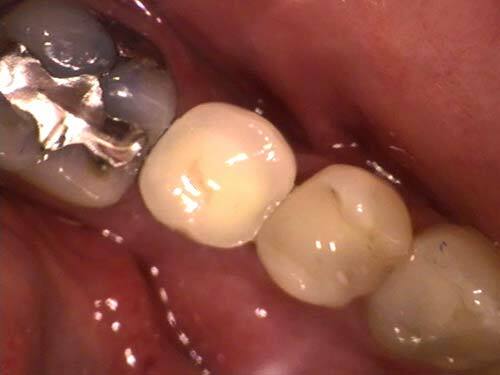 A common alternative to a dental implant to replace a single missing tooth is a dental bridge. 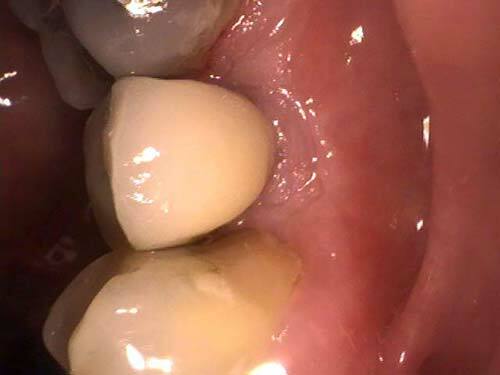 When preparing an area for a bridge, the 2 teeth adjacent to the missing tooth are ground down into stumps to be fitted for crowns which then act as supports for the false tooth. In many cases, this leads to grinding down perfectly healthy teeth. 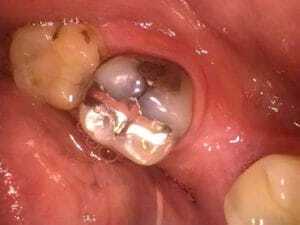 With dental implant treatment, the 2 adjacent teeth do not need to be altered and their health and structure can be maintained. One of the foremost advantages provided by dental implants is their durability. They allow the patient to eat and enjoy the foods they like and participate in the activities they enjoy without worrying about social embarrassment or compromised ability to eat or speak. Dental implants are designed to remain securely in place over many years. This means that patients can achieve complete comfort with the dental implant in their mouth. 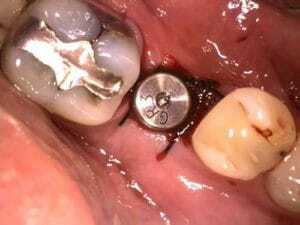 They won’t have to worry about the implant slipping and damaging gums, like they would with dentures. They won’t have to worry about the social embarrassment of a loose denture or speaking in an unnatural way, as dental implants provide a similar level of performance and comfort as natural teeth. It’s why so many are now choosing dental implants as a way to replace missing or damaged teeth. Contrary to many patient’s initial thoughts, the surgical placement of a dental implant involves very minimal discomfort. In the majority of cases, it is performed only under local anaesthetic. No time off of work/school is required after the surgical treatment and the majority of patients rank the discomfort as being a 1 or 2 out of a scale of 10. Instead of having to use dentures, which need be taken out of the mouth for cleaning and for some physical activities, patients can enjoy the 24/7 comfort of dental implants without worrying about moving or slipping dentures. The aesthetics of a dental implant are also superior to a denture, so patients can go about their day without worrying how their teeth will look and perform. Our trusted team at Guelph Village Dental has years of experience integrating dental implants for Guelph patients. We can help you achieve the ideal treatment while safeguarding your oral health for the long-term. To learn more on your full range of treatment options, book a consultation today!